Filey is a small seaside town on the North Yorkshire coast. Set between Bridlington and Scarborough, it was once a busy fishing port and more recently, has become famed as a tourist destination thanks to the large and mostly unspoiled beach, the wealth of accommodation and activities and the links to nearby Yorkshire attractions. Filey offers a warm welcome and an old fashioned charm which make it beloved by many returning guests every year. HomeAway has a diverse range of holiday cottages in Filey suitable for visiting groups and families. Filey is an extremely family oriented destination and many of the cottages offer a cosy home-from-home welcome with delightful traditional exteriors and modern fully equipped interiors. Typical kitchens include dishwashers, laundry facilities and microwaves, whilst welcoming lounges have wi-fi and DVD players. Many of the cottages have access to swimming pools, and there are a number which welcome pets as well as children. Parking and garden facilities are offered throughout. Whilst Filey offers a traditional seaside charm, England has a great deal more to offer visitors. Discover the world famous Salisbury Cathedral from Salisbury holiday apartments, which are conveniently located to offer access to Stonehenge, Wootton Bassett and nearby Devizes. Alternatively, holiday cottages on the Isle of Wight are the ideal destination for exploration, enjoyment and for taking advantage of the delightful climate. The Beach: Filey is shaped by its long and wide beach, which features on postcards and photographs galore. Winner of a Quality Coast Award and famed for luscious golden sand, it is the perfect place for relaxing or playing games. There is a RNLI lifeguard on duty, restricted areas for dogs, local amenities and facilities and some of the finest fish and chip shops in Yorkshire. Walking: If the beach promotes relaxation, the cliff areas around Filey holiday bungalows are the ideal spot for a days walking. Affectionately known as the Filey Brigg, these 15 meter high sand and limestone formations are the ideal location for walking, kiting, and bird watching, with oystercatchers, redshanks and purple sandpipers all nesting locally. Golf: The Filey Golf Club opened in 1897 and has been located in the north of the town ever since. In addition to a lengthy green and fairway, the club also boasts a nine hole short course, a brand new purpose built clubhouse and a warm welcome to visitors and regular members alike. The Filey Museum: A small but plentiful museum in the heart of town, the Filey Museum is highly ranked on a number of visitors guides. With local history dating back to prehistoric times, the museum includes fossils, local artefacts, displays on the history of fishing and a number of interactive experiences for younger visitors. Afternoon Tea: Filey is famed for good food and friendly service, so it’s no surprise to find that there are several highly recommended cafes and restaurants serving traditional afternoon tea, a particular must for international visitors. Many local favourites and are within easy access of holiday bungalows in Filey. Filey enjoys a mild marine climate which helps to preserve the flora and fauna around the headland. Sea breezes can often make conditions seem slightly cooler than the actual air temperature but in general colder conditions are few and far between. August is the hottest month with an average temperature of 18⁰C whilst January tends to be the coldest with a low temperature of 3⁰C often experienced. During the winter months the town can experience up to 19 days of rain with an average of 40mm falling per month. However, although August typically experiences fewer days of rainfall, with only 14, it is classed as the wettest month with up to 58mm falling. 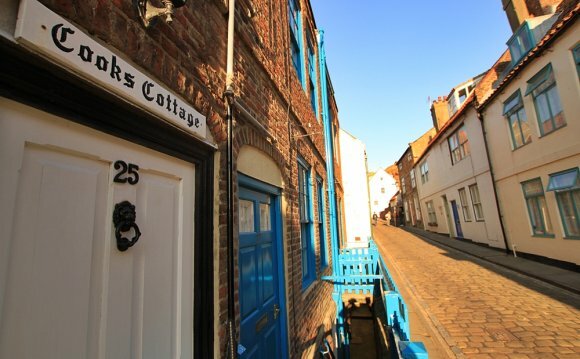 As might be expected in a busy seaside town, Filey holiday cottages are extremely accessible. Whilst the A64 provides a direct route into town from nearby York, there is also the A614 which leads directly into the town and is generally acknowledged to be a more pleasant and scenic drive. The town has its own train station, from which services in and out are frequent, and there are many bus and coach tours to take advantage of.